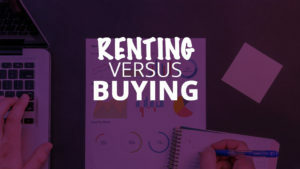 Renting Versus Buying a House in Savannah – Which one is Right for You? Considering the hefty price to buy a home, most young people begin their adult lives by renting. As they build up a career, save money and start a family the idea of owning a home becomes more pressing. Mortgage rates though still remain too far out of reach for many young people. In the last 10 years, homeownership among those aged 35 and younger has declined by 18%. Coupled with the aftershocks of the great recession and historic levels of student loan debt the results are easy to understand. Yet even if the finances are there to acquire a home, recent trends in some areas suggest that it may soon be cheaper to rent then buy in Savannah. In the end, whatever your final decision may be there’s a chance that it may not be a financial one. Buying a home can bring a lot of advantages and for the most part, it’s still cheaper, in the long run, to buy than rent but it calls for a large sum up-front and a few one-time costs. This can add up to a lot when everything is factored in. Earnest money – a payment that ranges from 1% to 3% of a home’s value to show that you are serious about the purchase. Down payment – a percentage of the homes price that is paid upfront. This ranges widely depending on credit profile, market conditions and type of mortgage loan and typically ranges from 3% to 20% of the purchase price. Home appraisal – a price paid to ensure the homes price matches the homes values, usually between $300 and $500. Home inspection – licensed home inspectors hired to find problems and defects that might not be apparent to the untrained eye. Usually, costs about the same as a home appraisal. Property taxes – as homeowners need to pay property taxes upfront a buyer will need to compensate a seller for taxes paid from the closing date to the end of the current tax period. Home insurance for the first year – you almost always need to pay the first years premium upfront. This cost varies widely based on location, your credit score and coverage limits. In addition. There will also be recurring payments over the months and years ahead. This includes loan payments, property taxes, insurance, utility bills and maintenance. Not forgetting as well on-time costs like furnishings, moving costs and renovation projects. If you can cover all of these costs though you can soon reap the benefits and save more money in the long run then you would from renting. This includes building home equity, tax benefits and the potential for rental income. Money aside, there’s also the personal benefits you gain from home ownership such as creative freedom to redo the house as you want and the chance to settle down and set some roots in the local community. Renting won’t have as many upfront costs but there will still be a few to go through before you can move in. Security deposit – made to insure against any damage to the property or broken leases, usually the price of one month. First month’s rent – you’ll need to pay the first months rent upfront along with the security deposit. Moving costs – same as homeowners, renters will still need to pay the costs of moving their furnishings and belongs to their new residence. You’ll also have a few recurring costs that will need to be covered each month. This will include your monthly rent, renter’s insurance (optional but recommended), utility bills and possibly laundry if the rental unit does not come with its own laundry machines. Renting a property will come with plenty of advantages if you’re not expecting to settle down and need the freedom to quickly move again if needed. You won’t be responsible for any maintenance or repairs such as burst pipes or malfunctioning air-conditioner units and you also won’t be influenced by changing prices in the real estate market. For people who don’t expect to stay in one place for more than 3 years or can’t afford the upfront cost for a purchase will be better choosing a rental. Savannah Rental prices have remained quite stable in recent years while those for mortgages have risen. However, when everything is measured out the costs of owning a home in Savannah are still about 33.1% cheaper than a rental. If you can afford to put 20% of the purchasing price down and a 30-year fixed rate mortgage then it makes perfect sense to buy rather than rent. Ultimately, most people will base their final decision on whether or not they’re ready for homeownership. It comes with a lot of responsibilities and a strong commitment but if you feel you’re ready and can afford it then the soon the better.